While the business outlook remains stable, seven percent of surveyed organizations shared that they plan to reduce headcount, as per the latest report by Willis Towers Watson. It is October already and in less than three months a new year will arrive. As we come at the end of an eventful year, the predictions for the next year begin. 2018 was another evolutionary year for the talent market, with a lot of predictions around AI and advanced technologies changing and replacing roles and creating a demand for new skill sets. However, not many organizations in APAC experienced a significant change in the market. As per the latest study by Willis Towers Watson (WTW) 60 percent of the surveyed organizations expected their 2018 company performance to be in line with 2017 results. Further, at the onset of quarter three of the financial year, it is only about five percent of the organizations that predict 2018 to be worse than the last year. In fact, about 35 percent have better expectations from the market in 2018. With the majority of the organizations experiencing a similar pattern in the marker, the salary expectations also remain similar to the last year. The Salary Budget Planning Report by WTW highlights the average salary increase for APAC has mildly rebounded from 2017. After a 5.6 percent increase in 2017 and then 5.7 percent in 2018, the regional average salary increase for 2019 is pegged at 5.9 percent. While the overall percentage for APAC seems to be low, nine out of 17 markets expect to see higher salary increases in 2019. These nine countries include Indonesia, China, Japan, and Bangladesh. However, the average increase in these countries is not even more than one percentage point. What percentage of salary increase is projected for various countries of the region? What are some high paying industries? And jobs for which function will be more in demand in 2019? The report further deep dives into each country and sector to answer these questions. Here are a few insights from the study. 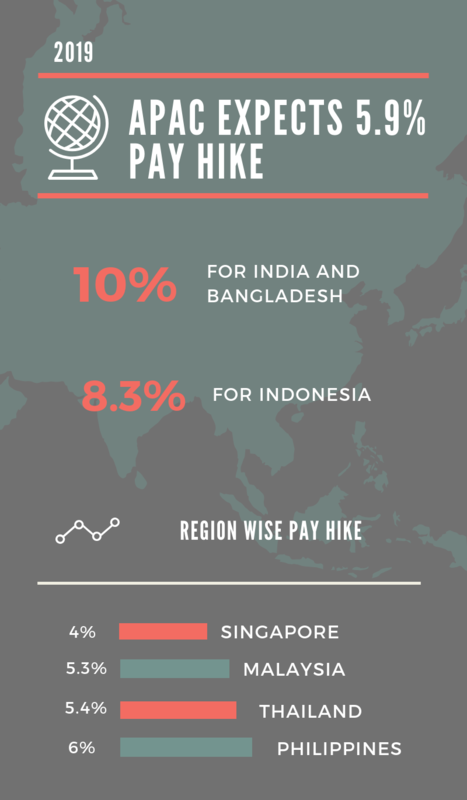 India and Bangladesh are the two countries with the highest percentage (10 percent) increase in pay in the entire APAC region. While for India the rise in salary is the same as the last three years, for Bangladesh the percentage has climbed by 0.7 points from 9.3 percent in 2017. But as a high inflation rate in Bangladesh impacts the projected salary increase, the real wage growth would be only about 4% shares Ruchika Pal, Chief Consultant, Talent Root Consulting. Other countries with a high salary increase include Indonesia (8.3 percent), China (6.9 percent) and Philippines (6 percent), followed by Malaysia and Thailand at 5.3 percent 5.4 percent, respectively. Pakistan and Vietnam are behind by one percent with an expected rise of 9.6 and 9.0 percent, respectively. The salary increment rate for Pakistan has also improved by six points from 9 percent last year. Increase in salary for Hong Kong and Singapore remains the same as last year (4 percent). The Pharmaceuticals sector is leading the way, while the financial services’ salary increases lag behind in most markets. The top two industries in terms of expected high pay hike in the APAC region are Pharmaceutical and Health Sciences and Consumer Products and Retail. Energy and Natural Resources and Financial Services are bottom two industries when it comes to salary increments. “The strong growth of the Pharmaceutical and Health Sciences industry in the region is helping to keep the sector’s salary increases ahead in most markets,” shares Sambhav Rakyan, Data Services Practice Leader, Asia Pacific, Willis Towers Watson. The reason that financial sector lags behind can be attributed to the intensifying competition from Fintech developments. Two-third of the surveyed organizations plan to maintain headcount in the next 12 to 24 months. However, 7 percent of them will look to reduce staff majorly due to automation. 14 percent site outsourcing and 2 percent say contingent workforce would be the reason for the reduction in headcount. “Sales, Marketing, Engineering, IT/IS, Fintech professionals would be the hot jobs in the market," shares Asep Susilo. On the other hand, Ruchika feels that while some industries project higher increments, there is no trend to indicate functional differentiation. “Over the years, critical skills have commanded higher increments, along with higher performance," she exclaims. Beyond the predictions of pay hikes made every year, the future of work is rapidly creating demand for niche and specialized skills, pushing companies to re-evaluate their total rewards programmes. “Workplace automation, artificial intelligence and robotics are expected to reshape a new combination of work, talent, skills requirements and work relationships. Organizations, therefore, should re-examine not just their talent strategies but also how they will remunerate and reward the workforce of the future,” says Sambhav. 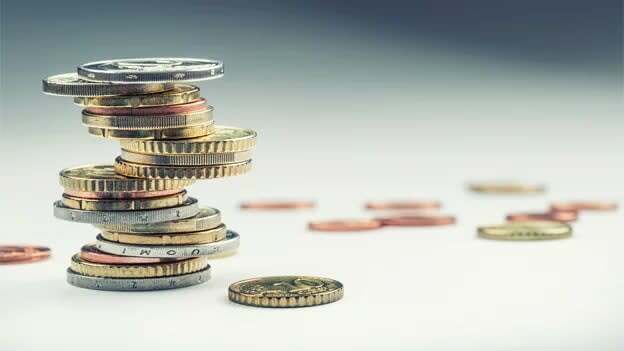 When it comes to reward strategy, there is a growing trend of using base pay as a proxy for variable pay and other rewards. All in all with rapidly changing skillsets in demand, shrinking budgets and the increasing challenge of talent scarcity, employers would have to think creatively about their rewards strategy and consider flexibility in managing and delivering rewards.